Every year I watch the Great British Bake Off and every year I feel inspired to get the kids in the kitchen to join me in creating some crazy, outlandish showstopper-style masterpiece*. 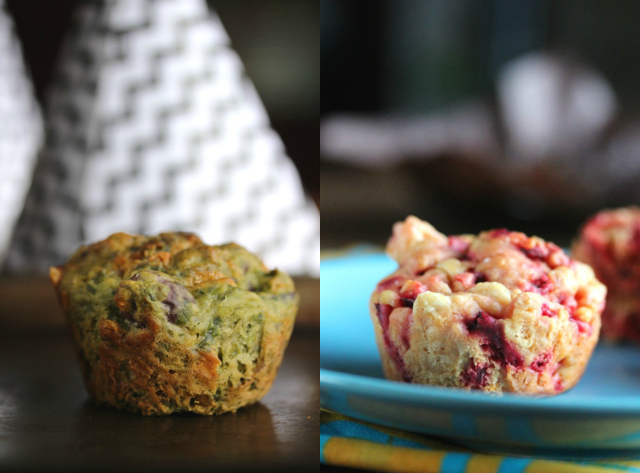 The problem is, and I know I’ve said this before on the blog, but I’m just not a natural-born baker. That’s not to say my bakes don’t taste good. Nine times out of ten they most certainly do. But all too often they just don’t look good. And that’s the whole point of a showstopper, isn’t it? To impress? To wow? So perhaps our attempt this year at a ghoulish bake for Halloween is more a pause-glance-and-nod-approvingly before moving on than a full-blown stop-them-in-their-tracks-in-awe showstopper. The children loved it though, and that’s what’s most important. 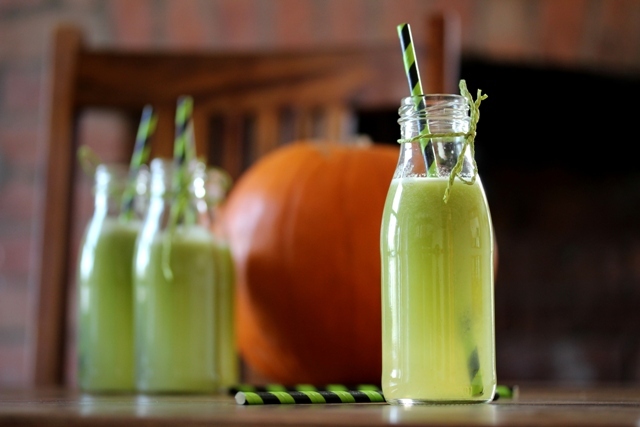 The Halloween-fuelled experiments have been continuing in full force in our kitchen. 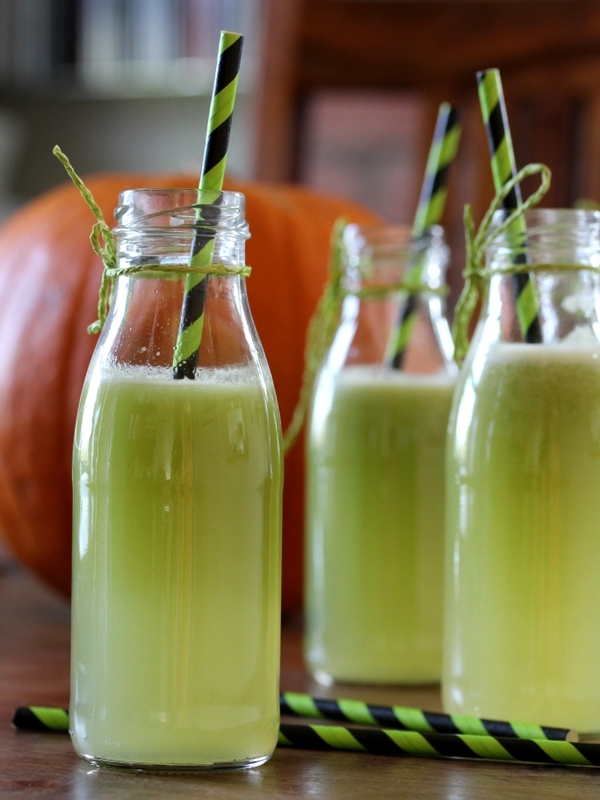 As well as our macabre muffins, the kids and I have also come up with this delicious green juice chiller. The Halloween frivolities have started a little early here. 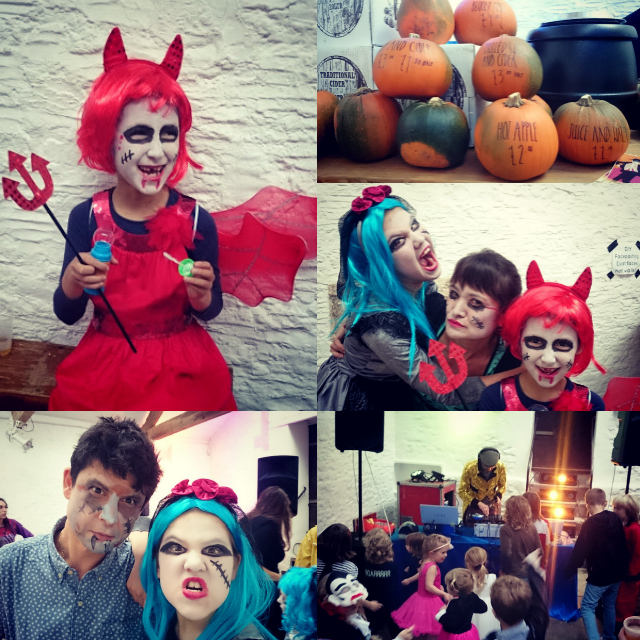 Last weekend we had an absolute ball at the Halloween-themed Reach for the Bubbles afternoon disco in Frome. We painted each others’ faces, scoffed West Indian style hot dogs, drank mulled cider (and hot apple juice), played drum and bass musical statues and took part in a Thriller line dance, all to an awesome soundtrack provided by the phenomenal Lionel Richtea on the decks. We’ve also been experimenting with some gruesome bakes in the Bangers & Mash kitchen. 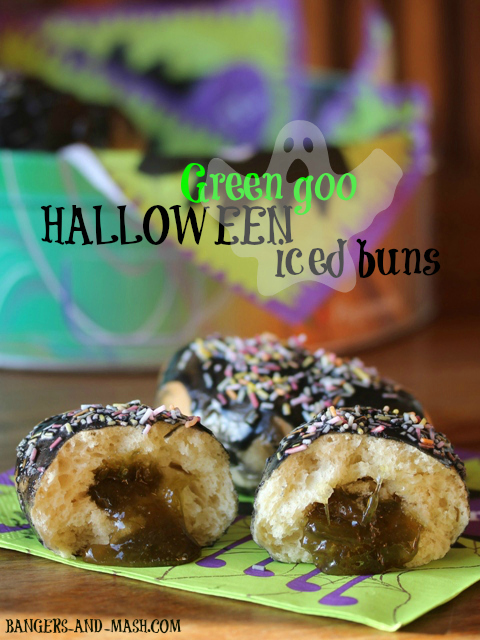 The kids wanted to see if we could come up with some terrifying but tasty snacks ready for the Halloween party season. And I wanted to see if we could make them vaguely healthy rather than the sugar-fuelled treats we generally seem swamped by this time of year. 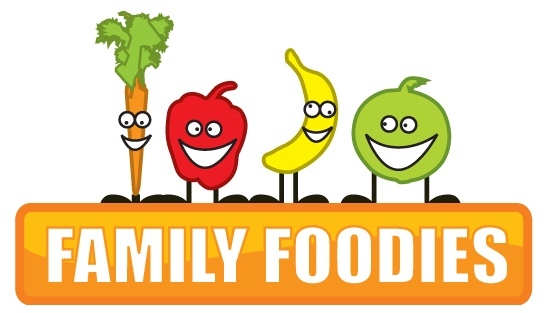 I always say this, but when I cook with my children, I have to be in just the right mood. A laid-back, chilled-out, hey-it’s-fine-to-wreck-the-kitchen kind of mood. Because cooking should be fun, right? For all of us, kids and parents alike. Which also means I won’t be too precious about what the end result actually looks like. Cake pops are very cute. After all, who doesn’t love food on a stick? I made some simple ones recently for a school cake sale and they sold out instantly. In fact, the school caretaker got in there first and bought some while we were still setting up. 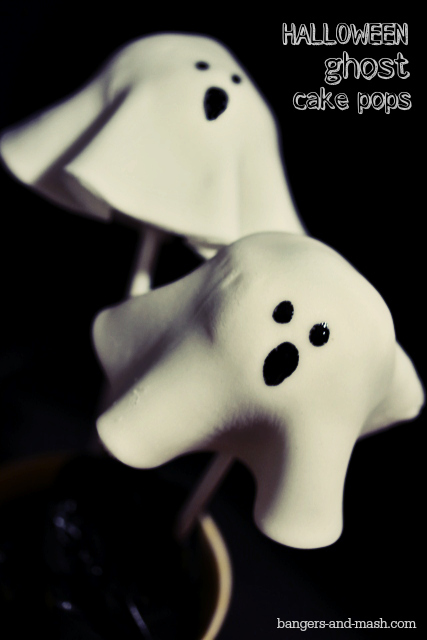 I’ve seen lots of beautifully decorated cake pops on websites and blogs recently and for some strange reason I’ve felt an overwhelming urge to create some special cake pops for Halloween. Now this just isn’t the kind of thing I do normally. My interest in baking has increased massively over the last couple of years but creating cleverly crafted cakes and daintily decorated delights is way out of my comfort zone. 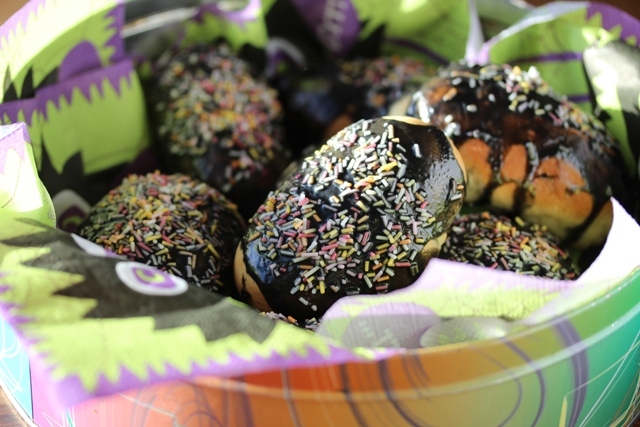 Admittedly, these little pumpkin pops are not an example of patisserie perfection I’m afraid, but they are a bit of fun and most importantly my children can’t get enough of them. 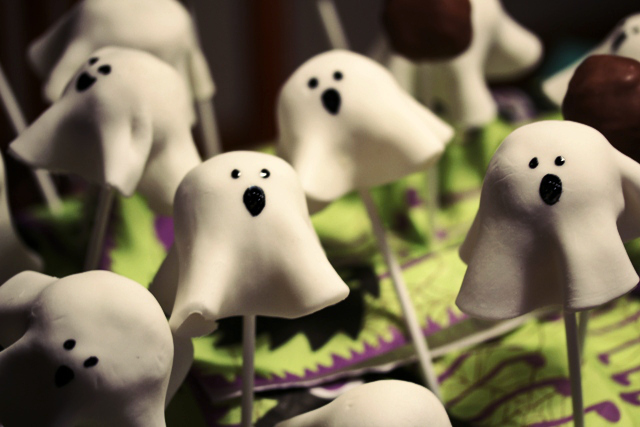 It took me a couple of attempts to get these Halloween cake pops right, mainly because white chocolate isn’t particularly easy to work with as a cake coating. The first time it took me ages to get the colouring right. I was adding a drop or two of red liquid food colour, then a drop of yellow, and a bit more red, and a bit more yellow, ad nauseum. Eventually the chocolate just split and went all grainy and horrible because I’d over-worked it. I added a little vegetable oil to loosen it again, which seemed to work but then the coating refused to set properly on the cakes and they ended up looking a complete and utter state. The second attempt was better. I used white chocolate again but went for a concentrate paste colouring and took lots more care not to overwork it. The end result, as you can see, is OK but I still haven’t ended up with the lovely smooth finish you get with normal chocolate. Next time – if there is a next time – I might try a white cake covering or ‘candy melts’ – it might taste ghastly but does that matter as long as it looks the part? There are various ways to make the cake pops themselves. I have seen a cake pop machine on the market but that seems a little excessive to me. I bought a special cake pops baking pan, which works fairly well but I don’t think it’s completely necessary. I’ve since found a few pop cake recipes online using ready-made cake; you simply mix with chocolate and roll into balls. No baking necessary. Grease the baking pan liberally with vegetable oil and dust with cocoa powder. Put the plain chocolate and butter in a large mixing bowl and heat gently in a microwave or over a large pan of hot water until melted. Mix in the caster sugar and cocoa, and then stir in the egg. Finally add in the flour, baking powder and salt and combine well. Spoon the mixture into a twelve-pop baking pan, filling each well so it creates a slight mound over the top. Put the lid on and secure. Bake for 20 minutes until a toothpick inserted into one of the holes comes out almost clean. Leave to cool for five minutes in the pan before removing and leaving to cool completely. 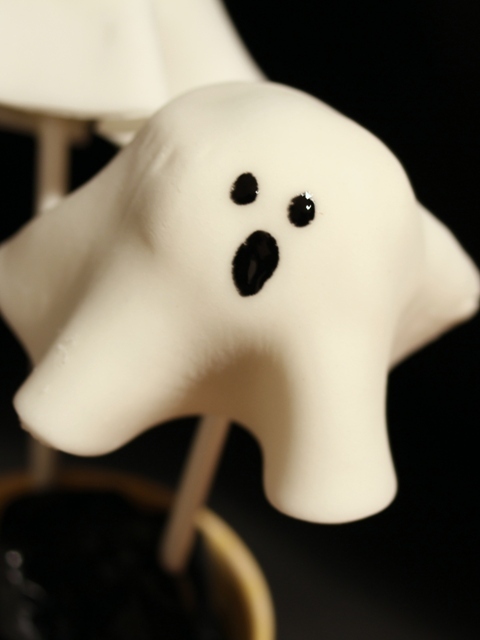 Melt a couple of the pieces of white chocolate and dip the lollipop sticks in before inserting into the cake pops. Put in the fridge for half an hour to allow the sticks to set into place. Line a plate or board with greaseproof paper. Melt the remainder of the white chocolate in a large bowl. Using a skewer, gradually add in a little of the orange colour paste at a time, stirring gently after each addition, until you get the shade of orange you want. Dip each cake pop into the orange chocolate using a metal spoon to pour over the chocolate and fully cover each one. Spin the cake to let the excess chocolate drip off. Place on the greaseproof paper and leave in a cool place or in the fridge for a few hours to set. Heat the jam gently in the microwave and leave to cool a little. Roll out the green icing and cut out leaf / star shapes. Stick the icing onto the cake pops using a little smear of jam. Lastly draw on the faces using the black icing – triangles for eyes and noses and zig-zag mouths. Leave again in a cool place to allow everything to set into place. Preferably somewhere up high and out of sight, as when the little ones spot them, they won’t be around for long. Happy Halloween!